I was in the US from 19 – 25 April, on the way back from Australia to France. I was with my kids, so it wasn’t a full on mammal fest, but I did manage to see a few new species including my 1000th. 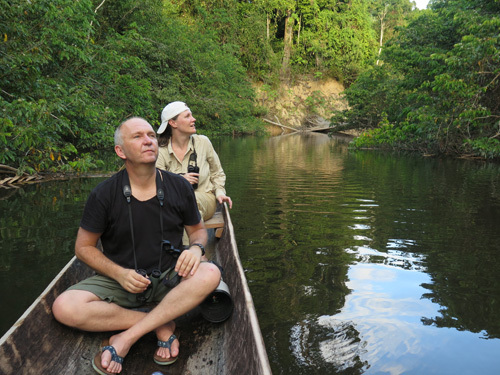 The various information is on www.mammalwatching.com on the relevant pages, but here is a summary. California – Carizo Plain National Monument. California Ground Squirrel en route from L.A., and Nelson’s Antelope Squirrels were quite easy to see in the evening in and near the park. 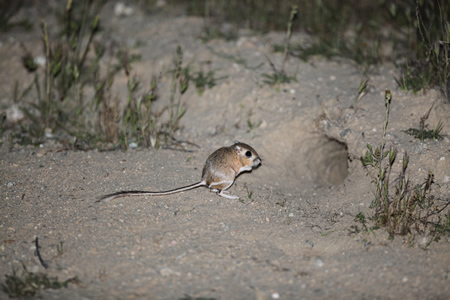 I drove along the long park road just after dark and saw at least 1 Kit Fox on the road and more than 20 Kangaroo Rats, most of which were the quite rare Giant Kangaroo Rats (but I suspect there was a second smaller species too – perhaps Heerman’s Kangaroo Rat). Also saw a couple of Black-tailed Jackrabbits. Thanks Vladimir Dinets for the tip! 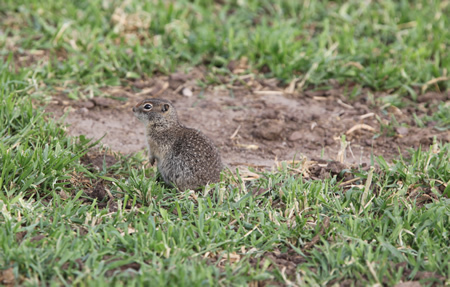 Arizona – Round-tailed Ground Squirrels are common around the visitors centre at Casa Grande National Monument, just south of Phoenix. A ranch just west of Seligman on Route 66, has had Black-footed Ferrets successsfully reintroduced. 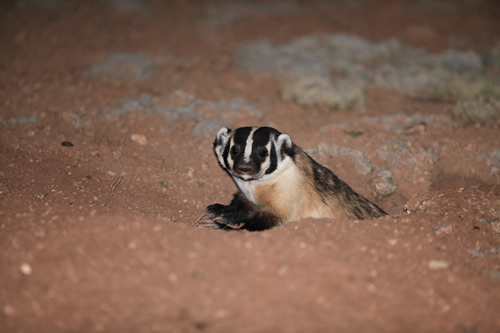 During the day Gunnison’s Prarie Dogs are common, and at night you should have an excellent chance of spotlighting a Ferret along the northern side of Route 66 (the best area is the 10 mile stretch that starts 3 or 4 miles west of Seligman running through the Aubrey Valley). The ferrets are apparently most active between midnight and 6am. I spent 6 hours looking from 9pm to 3am but couldn’t find one (a week before people had been seeing as many as 13 during a night’s spotlighting!). Immensely frustrating and may have been because the weather had gotten a bit colder and windier, or may have been because I was crap at spotlighting 🙁 But I did see 3 Badgers, Mule Deer, a Kangaroo Rat, lots of Desert Cottontails and a Coyote. Yellowstone NP – lots of Bison and Elk, a few Pronghorns and Mule Deer , two separate Wolves (one in the north and one near Old Faithful), a Grizzly Bear (near the Lamar Valley), a few Mountain Cottontails (around Gardiner), a couple of Uinta Ground Squirrels near Jackson Hole, and a Least Chipmunk (but not the Uinta Chipmunk I was looking for) at Mammoth Campground. Idaho – where Matt and Jennifer Miller looked after me and the kids fabulously. We started at Silver Creek Preserve, a beautiful spot, with a lovely little cabin, about 2 hours east of Boise on Highway 20, at the settlement of Picabo. Columbia Ground Squirrels were common in the area, and there was an enormous amount of Montane Vole activity – their burrows and runs were everywhere, though I only saw one animal and could only trap North American Deer Mice. We saw several Muskrats in the creek near the cabin, as well as some Mountain Cottontails, a Coyote and a few Mule Deer. Moose are often here though we couldn’t find any. The manger of the preserve also tried to find me a Bushy-tailed Wood Rat which are often resident in farm buildings. 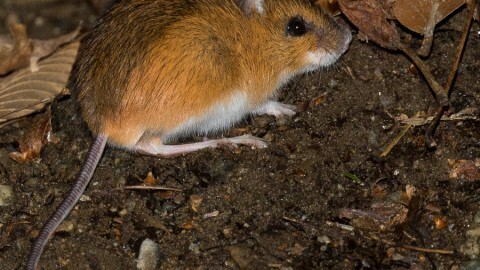 But though 2010 was a great year for voles, it was a bad year for Packrats and we didn’t find one. I did enjoy her stories of how the rats had been know to steal her car keys from the house, and tomatoes from the garden, but only to decorate their nests! Back in Boise Matt showed me Piute Ground Squirrels at Indian Creek Recreation Area (my 1000th mammal), and Idaho Ground Squirrels – America’s rarest, but though they are scarce they are not hard to find in the right spot. Matt took me to one of the few known colonies, less than an hour from Boise, just outside the town of Emmett, off Van Dusen Road. The colony we saw is all on private ranch lands so you have to watch them from the road. If you continue on that road, there are some smaller colonies on public property (the area called Squaw Butte). We must have seen over a hundred animals in less than 5 minutes, but this is a large proportion of the total population. Thank you to the many people who gave advice and help and particularly to Matt and Jennifer Miller for looking after us so well in Boise. Congratulations on hitting the thousand! Plodding along still sub-200 I appreciate the effort that has gone into that terrific total. Well done, on to two thousand then…. Well done – so are you the first person ever to crack 1,000 mammals?